High Energy Accelerator Research Organization (KEK) since 2015. Professor Funamori graduated from the University of Tokyo’s Department of Geophysics in 1991, then from the Ph.D. program in Earth and Planetary Physics in 1995. In 1994 he became a fellow of the Japan Society for the Promotion of Science (working at the Institute for Solid State Physics at the University of Tokyo), and in 1996 became a researcher at the Miller Institute for Basic Research in Science at the University of California, Berkeley. He also worked as an assistant professor in the Department of Physics at Keio University and as a lecturer (associate professor) in the Department of Earth and Planetary Science at the University of Tokyo, before taking up his current position in 2004. Today, space is much closer than it once was. There are now astronauts going about their work in the International Space Station, 400 km above our heads. Much of Earth’s interior is physically closer, but in a sense much farther away. Earth has a radius of around 6400 km, but the deepest we humans have ever penetrated is a mere 10 km down, only managing to dig through a very small part of the outermost layer of our planet. Earth’s center is estimated to be at a pressure of 3.6 million atmospheres and temperature of around 6000 °C. We’re very far away from being able to create vehicles that can withstand such an environment, and may never learn to do so. Earth’s interior may therefore represent humanity’s true eternal frontier. The structure and properties of matter change significantly when placed under high pressures. The results can be counterintuitive, like ice that isn’t cold or that sinks in water. Ice is a crystal formed by orderly arrangements of hydrogen and oxygen atoms. It can form from sufficiently cold water at a single atmosphere of pressure, like that found on the Earth’s surface, but it can also be formed by placing water under pressure. Ice formed in this way and surface ice have very different arrangements of atoms (crystalline structure), making their properties quite different. Ice formed under high pressure has a high melting point and a specific gravity greater than that of water. This is why we can create ice with such unusual properties, like not being cold or sinking in water. 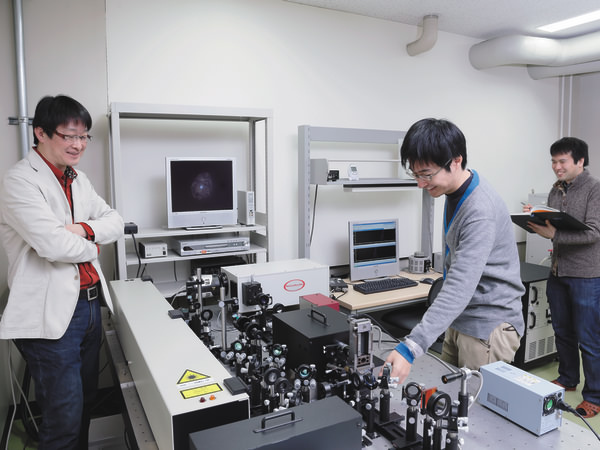 Professor Funamori became interested in the properties of matter under ultra-high pressures after taking part in a related experiment as a fourth year undergraduate student. As is well known, pencil lead (graphite) and diamond are made of the same thing—carbon atoms. Silicates, which are the principal component of the Earth’s mantle, behave similarly. Under low pressures, silicon has four “arms” that extend and bind with oxygen, but under high pressures it has six arms instead. Such changes have been extensively studied in crystals, but changes in the structures and properties of materials with no regularity to their atomic arrangement—materials like glass and liquids—remain largely unknown. The Funamori Lab is performing experiments on such materials one by one, to see what they can learn. The test samples used in high-pressure experiments are quite small, from 10 to 100 microns. Those samples are bombarded with powerful X-rays, and their structures are determined from the resulting diffraction patterns. Assistant Professor Keisuke Nishida says, “It’s interesting that we’re learning about enormous things like the interiors of planets using such tiny samples.” The laboratory also presides over a nationwide study group aimed at developing new areas in high-pressure research at the next-generation synchrotron radiation facilities (under construction or in the planning stage in Japan or abroad). The team works together closely, as they pursue that which cannot be seen. 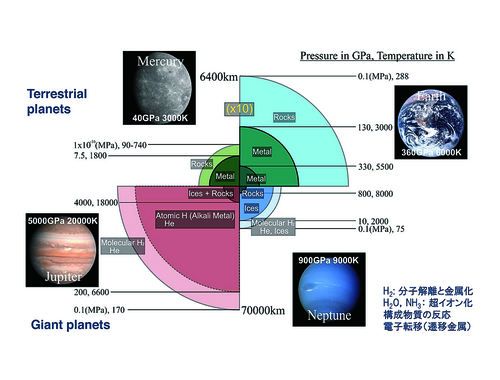 A comparison of the pressures and temperatures at the surface and within Earth, Mercury, Jupiter, and Neptune. Rocky planets are shown at ten times their actual radius for comparison with the gas giants. The interior of each has pressures and temperatures far exceeding those found on the surface. As humans are accustomed to an environment of 0.1 MPa (1 atmosphere) and 288 K (15 °C), these quantities represent phenomena that are beyond our ability to guess at.